Charlie Chaplin is most known for making us laugh, but his secret life is far from funny. Chaplin was a titan in early Hollywood, directing and starring in his own movies. By the early 1920s almost everyone knew his name. What they didn’t know was that Chaplin harbored dark sexual perversions that only a star of his caliber would have been able to keep quiet. Some of these, like his attraction to much younger women, was even flaunted out in the open due to society’s feelings at the time. Chaplin was married 4 times in his life, twice he married 16-year-old girls, and his 4th wife, at 18-years-old, was over 30 years younger than him. While these were technically legal for the time they raise eyebrows now, especially when you consider the circumstances of the marriages. His first wife, 16-year-old Mildred Harris was a young actress who had starred in a handful of smaller films. Chaplin, then 29, married her when he believed she was pregnant with his child. The marriage lasted only 2 years. When he was 35 he married 16-year-old Lita Grey. The aspiring actress claimed later in life that Chaplin forced her to marry him after she became unexpectedly pregnant. The marriage was short-lived and the divorce was a messy one. Revelations about Chaplin sprung from a 50-page divorce filing, huge for the time, that showed Chaplin had demanded Grey have an abortion. It was only after that came to light that the public started to question Chaplin’s behavior. Hollywood is forgiving, and even the abortion rumors couldn’t dull his star completely. 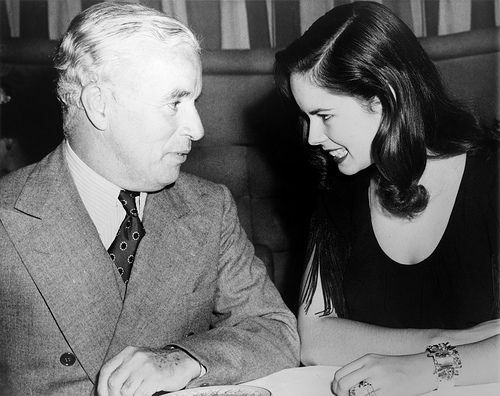 Still continuing to work Chaplin met Broadway star Paulette Goddard when he was 43. At 22 she’s actually the oldest of Chaplin’s wives, but what is most concerning is her claim that she told Chaplin she was only 17. The marriage ended with Goddard walking out on her husband after only a few years. When he was in his 50s Chaplin finally found true love, or at least a woman who wouldn’t leave. He married his 4th wife, Oona O’Neill 1 month after she turned 18. They actually had quite a successful marriage, lasting from 1943 until 1977. It’s hard to imagine a leading man in Hollywood getting away with marrying one 16-year-old much less 3 women under 20. Age may just be a number, but 3 is a pattern that’s too concerning to chalk up to love. Does this change your opinion of the legendary star?